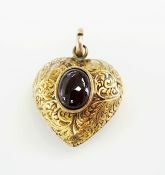 Discover our Fine Selection of Antique Heart Pendants, Estate Heart Pendants, Vintage Heart Pendants, Art Deco Heart Pendants and Modern Heart Pendants Below. 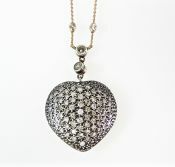 For a larger selection or a custom heart shaped pendant please contact us or visit our store. A beautiful vintage 10kt yellow gold heart pendant, circa 1950's, featuring 22 round facetted cut dark blue sapphires, est. 1.88ct. 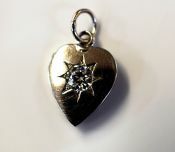 One 18 karat white gold heart-shaped pendant. Twenty-one invisible-set princess cut diamonds (0.54 carats: SI1-SI2 clarity: G-H colour). One 10 karat yellow gold curb link chain and diamond heart shaped pendant. Sixteen single cut diamonds (0.28 carats: SI clarity: J-K colour).